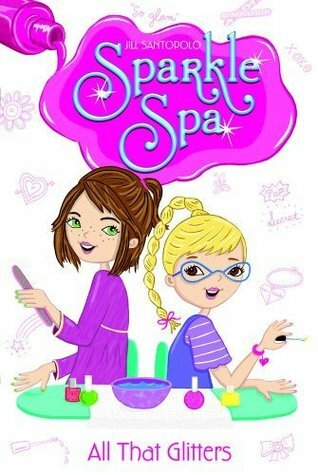 Ms. Yingling Reads: Sparkle Spa! ARC from Young Adult Books Central and reviewed there. Aly (who is in 5th grade) and her sister Brooke (who is only in third) love to help out at their mother's nail salon, True Colors. Each girl has age appropriate tasks to do, and there are a lot of family rules; for examples, while the girls can always wear toenail polish, they can only have nail polish on during the weekends. When an older girl from school wants Aly to do her rainbow manicure so she doesn't have to wait, Aly's mom makes a rare exception, but then the girls entire soccer team wants the same manicure. Since the salon is super busy, Aly and Brooke lobby to open up their own spa just for kids in the back of the shop. After some arranging, Sparkle Spa opens and just takes donation, as long as the girls have their homework done! Strengths: I liked how Aly and Brooke were willing to work within the structure of family rules to accomplish what they wanted. They presented their business plan to their parents very reasonably, and even though they ran into some difficulties, really did have the best interest of the family business in mind. Problems were realistic and addressed in constructive ways. Weaknesses: A nail salon? 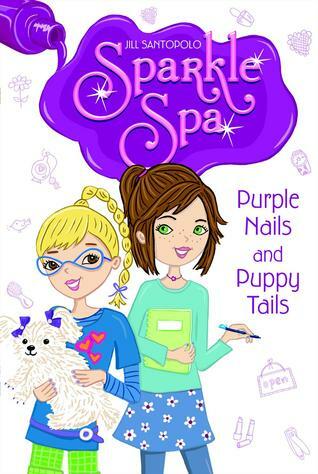 Must say that I've never had a manicure or a pedicure, so didn't understand the entire premise of this, but it is a good book for girls who like My Life in Pink and Green, The Teashop Girls, or the books about girls starting cup cake businesses. One of the regulars at True Colors has a small dog who is going to be a spokesdog for a local animal shelter. When the dog gets loose in the salon, Aly repairs the dog's paw-dicure, and gets interested in helping with the shelter, which is trying to place ten dogs in forever homes. With the donations from Sparkle Spa, they spiff up the dogs. Aly and Brooke would both like a dog at home, but their parents say no. To makes matters more complicated, they are interested in different dogs from the shelter. In the end, their parents are impressed with their responsibility, and the family does get a dog. Strengths: Again, the girls make a plan and work for what they want. Their family is supportive, but requires them to make a good effort. Again, I'm not understanding the whole nail polish thing, but girls who do enjoy nail polish will like the manicure hints at the end of the book. 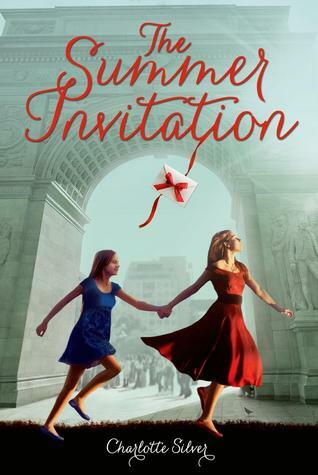 Teens Franny and Valentine (pronounced to rhyme with "lean") live in San Francisco, but when an old friend of their mother's, Aunt Theo, writes a letter inviting the girls to spend the summer at her apartment in Greenwich Village, their parents blithely send them off. Of course, Theo will still be in Europe for most of the summer, but her former ward, Clover (age 28), will be there to watch over the girls. Thus begins a round of museums, fancy restaurants, and clothes shopping for appropriate outfits that do not consist of the "trousers" Theo holds in scorn. Since Clover is an artist, Franny and Valentine spend a fair amount of time on their own exploring the city. The girls meet a variety of people from Theo and Clover's pasts, and have some romances of their own. Theo is expected back in the middle of August, so the young women put together a party bringing together a quirky cast of characters before heading back to their regularly scheduled lives. Strengths: This certainly was a Slice of Life into a rarefied world that few teens will ever get to experience, and while there are some slightly risque things (lingerie shopping, Valentine staying overnight with her boyfriend), there is nothing graphic. This reminded me slightly of an older teen version of Elizabeth Enright's The Saturdays, which is one of my favorites. Weaknesses: I don't think the real audience for this is teen girls. There is so much back information (movies of the 1950s, foreign customs, fancy restaurants, fashion, NYC in general) on which the understanding of the story depends, and most readers will not have any idea about so much of it (The Umbrellas of Cherbourg?). Knowing that the author had an unconventional childhood helps this book make sense, but I still can't see any of my middle grade readers enjoying this one.